As a native of Alabama, former heavyweight champion Evander Holyfield had the opportunity to speak to those in attendance at a dinner to mark the closing of the Olympic Boxing Trials in Mobile, and he may have turned a few heads when he said that pay-per-view has been the biggest factor that has killed boxing in recent years, not the emergence of mixed martial arts. “What’s hurting boxing is they’re not putting it on free television. When you put anything on television, it represents somebody. Every person that gets out, represents somebody,” he told the website AL.com. 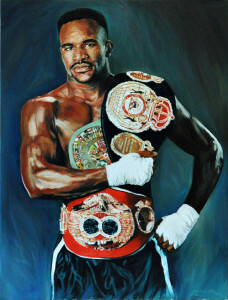 To expand on his thoughts, Holyfield explained that when he saw the Spinks brothers win gold medals at the 1976 Olympics, that served as an example to him. These are strange assertions to make because in a way, Holyfield is biting the hand that fed him. After all, he rose to prominence during an era where the universe of pay-per-view expanded greatly, and there is no doubt that expansion made him a man who became rich beyond his wildest dreams. In fact, Holyfield has been involved in fights that have generated 12.6 million buys, “representing” over half a billion dollars in revenue, and that places him third on the all-time list. Furthermore, it can be argued that Holyfield, if we take his comments at face value, is being just a bit hypocritical here, because his fights with Frans Botha and Sherman Williams, which most people would not consider to be legitimate pay-per-view attractions, were nonetheless held as subscriber-only events. A proposed rematch with Botha, which is slated to take place later this year in South Africa, would most likely go the pay-per-view route as well, since Botha has had to take it upon himself to raise funds to guarantee the “Real Deal” a million dollars. But the funny thing is, Holyfield is absolutely right. Even though you can claim that he has been part of the “problem,” there is no denying that indeed a problem exists. And the problem isn’t that there are pay-per-view fights, but that there is not a whole lot out there that constitutes easy access. What we can classify as “free television” these days may be different from what it was twenty years ago; after all, when cable was in its earlier years there was more value placed on exposure over the broadcast networks. Now almost everybody has it, so the more accurate statement for the times we live in, at least here in the U.S., is that “free” means “not premium.” That is to say, not pay-per-view and not HBO, Showtime or some other service that someone needs to subscribe to separately. The fights we have seen on the over-the-air networks like CBS, NBC, ABC or Fox have been few and far between. As I was just getting involved in this business, those outlets were critical to building stars. And they were very successful in elevating fighters to the status of pay-per-view attractiveness. That’s because the networks were able to gather an audience, tell a story, and air a fight between combatants who were both of world-class status, or were at least competitively matched. Say what you want about the abrasiveness of Ferdie Pacheco, or his position of conflict of interest in being both “matchmaker” and color commentator, but his series of fights on NBC, and the philosophy behind it (if you go back that far, you know doubt heard the term “crossroad fights” time and again) was a winner. When a fighter got through some of those matches, the public could buy the proposition that he was legitimate. At the same time, it was a great platform for exposing those fighters who were more sizzle than substance. So the entities were being groomed, and as a lot of people had seen them already, they had a built-in following that they could carry into a pay-per-view telecast. Such is not the case now. Sure, ESPN does its “Friday Night Fights,” but that is a version that is scaled way down from what it used to present. Showtime did a decent job of emulating NBC’s old strategy with its “ShoBox” series, and even the harshest critic of HBO has to admit that the premium channel has put on many of the important fights, but the fact is, the price tag on subscribing to these services puts a limit on how many people are going to see them. In a way, you are paying to watch fighters who they are prepping for you to pay even more to watch. By contrast, the UFC, which does a lot of business on pay-per-view, has done a good job of getting to the “free” audience via Spike TV and “The Ultimate Fighter.” That showed some real marketing savvy. You can argue, among other things, that if you really want to see boxing, you’re going to subscribe to HBO, Showtime, or both, but that is to miss the point. The point is that to grow a sport like boxing, you need more than the people who are already predisposed to watch your product. You need to make NEW boxing fans. And the “free” TV model, where often the fights were placed within an anthology series (e.g., Wide World of Sports, CBS Sports Spectacular, NBC Sportsworld) was an ideal vehicle for that. At the risk of overusing the word “point,” look at it as if the fan was going from Point A, which is watching on free TV, to Point B, watching on a premium network, to Point C, buying a pay-per-view, with perhaps a Point B-2 being attendance at a live boxing show. There are parts of that process that are missing with the lack of boxing on so-called “regular” television. Sponsors have become less enamored with the sport; in fact, you could say they have fled like lemmings. And one of the effects is that fights that can’t get to a wider audience – perhaps like the Holyfield fights we mentioned earlier in the story – have no choice but to look for any audience it can find on pay-per-view. I would think ESPN has the ability to take steps toward remedying the situation right now, if they want to. They essentially comprise whatever ABC Sports is, so they could put boxing on that platform as a way of creating a new audience, and I am sure they could muscle some sponsors into coming along for the ride. But for all the lip service, do they really believe enough in the sport? You would think that since they don’t have any equity to speak of in mixed martial arts, they would be anxious to increase the value of the boxing product, and the boxing audience. But unless someone does it, it won’t get done.